Starting a planted aquarium in your home can be an engaging and rewarding hobby. But with so many choices of aquatic flora and fauna, how does a beginner choose the right plants? 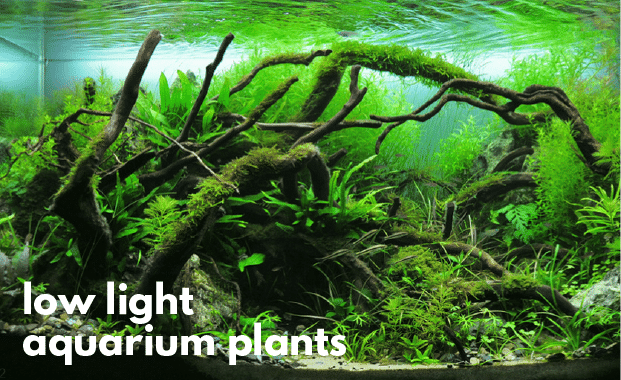 We’ve created a comprehensive list of the top 25 low light aquarium plants, ideal for beginners and experienced fish-keepers alike. Because each aquarium (and aquarist!) is unique, there is no “one size fits all” plant species to select for your aquarium. For that reason, this list includes a handy scoring system which ranks each plant based on their light level required, level of care required, and compatibility with other plants and fish. Root Tabs: Root tabs are small, nutrient-packed discs placed under the substrate to help with nutrient levels. I highly recommend Seachem Root Tabs. I’ve found these to be the best on the market. Liquid fertilizer: Liquid fertilizer should be used more sparingly than root tabs, as it can tend to cause algae outbreaks. That said, Seachem Flourish is great for propelling growth in aquarium plants that don’t root into the substrate. Seachem Flourish Excel: Typically, heavily stocked planted tanks require expensive, complicated CO2 systems. Seachem Excel, though, helps deliver all the same benefits without expensive setups. I would really recommend picking up a bottle, especially for low-light setups. I know we are talking about “low-light” setups here, but I also highly recommend the NICREW Classic LED Light to anyone looking for a cheap, effective light. It is definitely the best deal you can get for your money. 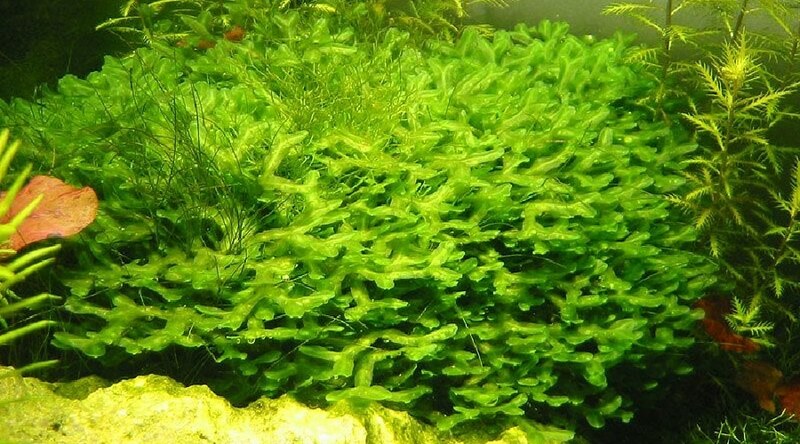 Java moss is a very common moss that grows naturally on rocks and trees in tropical climate zones. It lacks roots, meaning that the moss can float through the water to gain any nutrients it needs. However, it will also attach itself to aquarium décor or substrate. Java moss is characterized by its tiny oval shaped leaves, which are useful for obscuring unattractive aquarium equipment such as filters. The moss will easily adhere to any porous surface, making it perfect for décor. 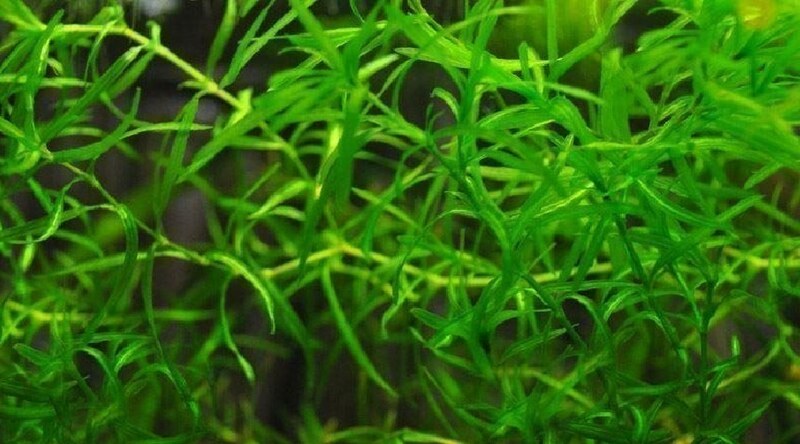 Java moss is a slow grower but it difficult to kill as it filters the nutrients it needs directly from the water through its leaves. Size can vary greatly; the moss can be molded into various shapes or used in a mat, so the size is up to you. Light level required: Low, but more light can be provided to encourage growth. Too much light will lead to overgrowth. The green hygro is a rapid growing stem plant with long leaves, which may vary from green to brown to red depending on the lighting provided. This plant prefers a substantial substrate in order to anchor its roots, so make sure to pick out a good planted aquarium substrate. In order to prevent browning, only low lighting should be used. Due to the prolific growth of the green hygro, it is considered a weed and is prohibited in some states. Check local laws before acquiring the green hygro for your aquarium. The green hygro will continue to grow unchecked and may unless pruned often. Light level required: Low, browning will occur with overlighting. Rapid growth will occur even in very low light. Compatibility: Good, but must be pruned often in order to prevent it from taking over. Avoid using in tanks with goldfish, as they will likely over-feed on the plant and kill it rapidly. The sunset hygro is a close relative of the green hygro, with the main difference being the coloration of the leaves. The sunset hygro has red-pink leaves with white veins. Like the green hygro, it must be pruned often. In addition, in order to maintain the bright red hues of its leaves the water must contain appropriate levels of iron. Light level required: Low-moderate light. Compatibility: Good, but must be pruned to avoid taking over the tank. Increasing the phosphate levels if the tank may also reduce the incredibly rapid growth. 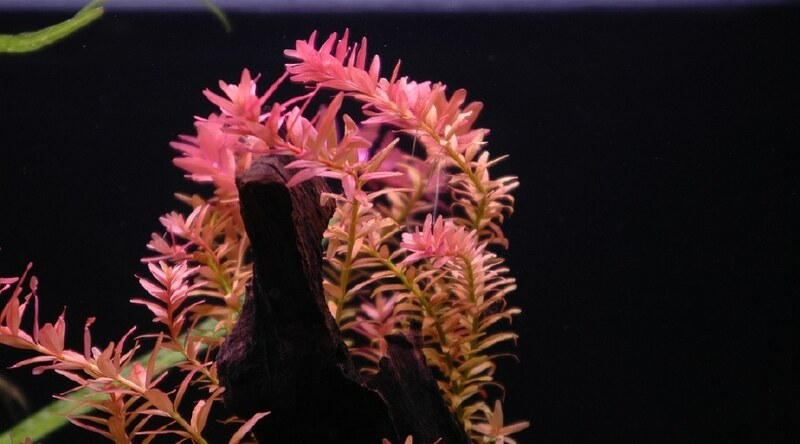 The rotala rotundfolia is a recognizable aquarium plant known for its pink coloration and narrow rounded leaves which, when allowed to grow to the surface of the water, will cascade downward. This plant is another example of a rapid growth plant which requires the proper lighting to achieve optimal coloration. Like hygros, it must also be pruned often in order to avoid overgrowth. Rotalas generally do not exceed 6” in width, but will continue to grow vertically and climb the sides of the aquarium. Light level required: Moderate. Too-low light will result in yellow-green leaves. Can flourish as a low light plant as long as sufficient micronutrients are provided. Compatibility: Good, but must be pruned in order to avoid prolific growth. The rotala indica is closely related to the rotundifolia, with only a few minor differences. The indica has more rounded leaves which tend to stay green regardless of lighting conditions, while only the stem of the plant presents a reddish hue. Both species can be planted individually or in a small bunch, but will require heavy pruning. Additionally, the indica does not require as much light as the rotundifolia in order to maintain its coloration. Hornwort has a unique foliage pattern which gives the plant its nickname of “Coontail”. Leaves grow outwards in numerous shoots which give the appearance of a bushy tail. 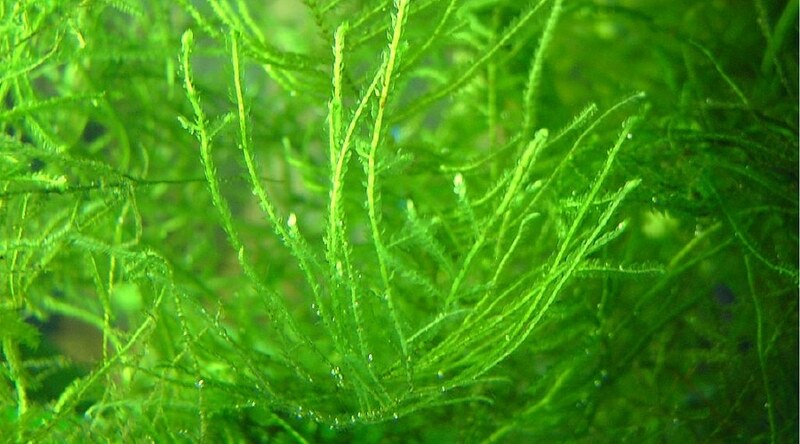 The hornwort is bright green in color, and does not have true roots meaning it does not require a solid substrate. It will attach itself to objects in the aquarium, or may float freely in the water. Hornwort grows quickly and provides a good habitat for newborn fish. 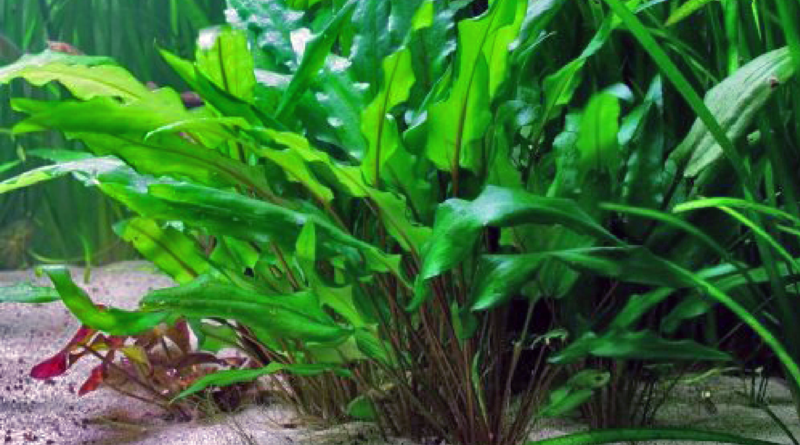 The java fern is a versatile, ideal plant that prefers low light aquariums. 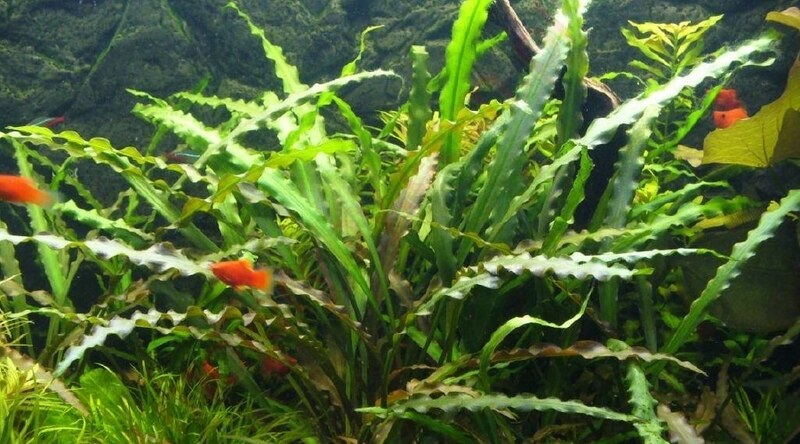 Java ferns are slow to grow at first, but will gradually begin to spread across the aquarium, eventually attaining a height of 12-14” and a width of approximately 6”. The leaves of the java fern can vary greatly across varieties, and are generally long and thin. 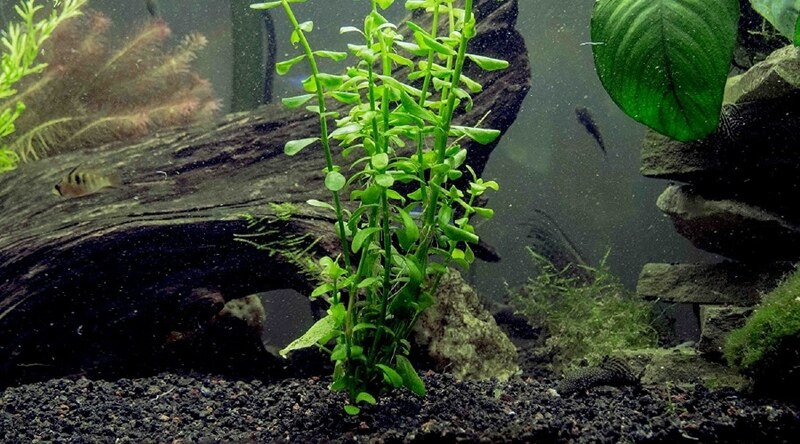 Java ferns can thrive when anchored to the bottom of the tank by gravel, or by floating in the tank, where it will eventually find an object to anchor its roots to. The java fern is a hearty plant that does not require special lighting, but should not be subjected to overly harsh lighting. Lush green foliage with a unique texture makes the parrot’s feather stand out among aquatic plants. 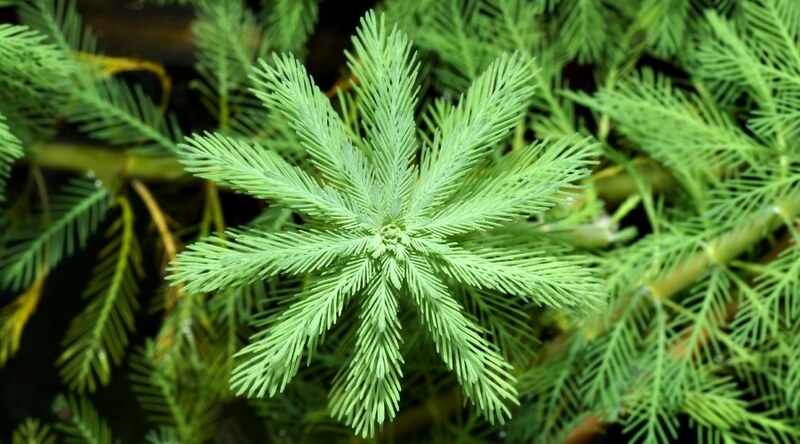 Parrot’s feather is popular for its use as a shade and hiding material for aquatic animals. Like hornwort, this plant tends to float in the water, but can be anchored using a shallow substrate. Light level required: Moderate to high, which can be achieved by having the aquarium close to a window in addition to the use of low lighting within the tank. Compatibility: Excellent, especially with goldfish, guppies, and minnows. The moneywort is a creeping plant known by many names and commonly used to add to the color of the aquarium. The moneywort has small, oblong leaves bright green in color that grow upwards along sturdy stalks. Shoots of moneywort are often planted close together to create contrast amongst other plants. Moneywort tends to grow vertically, achieving heights of approximately 6-8”. Compatibility: Excellent, thrives in most aquarium environments. The leaves of the Brazilian pennywort are light green and bean shaped branching from vine-like stems. Like many others, this plant can be kept as a floating plant or can be rooted to the substrate. 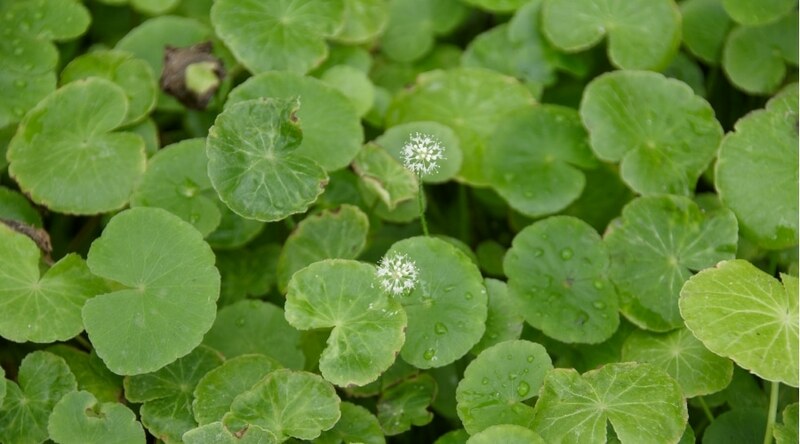 The pennywort is a rapid growth plant that must be pruned often, but is worth the effort as it is a very attractive plant and can be used anywhere within the aquarium. Light level required: Any, but low is sufficient to hinder overgrowth. Compatibility: Should not be included in tanks with goldfish or cichlids, as it can be a relatively delicate plant. Crypt wendtii is a highly variable plant species which can exhibit brown, red, or green leaves in various textures and sizes. Generally, the leaves are long with waved edges, and the leaves can reach lengths upwards of 18”. 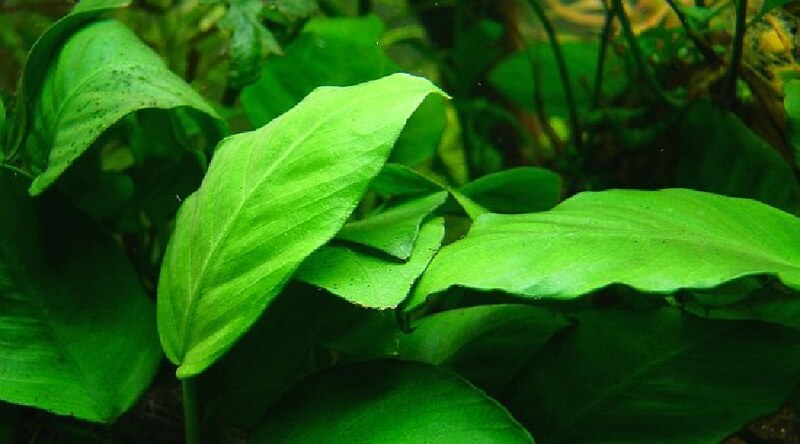 The crypt wendtii is a popular plant due to its versatility and may be used as a focal point within the aquarium. Light level required: Thrives in any lighting conditions. Level of care: Intermediate. Highly sensitive to changing conditions within the aquarium. Compatibility: Good but should not be included in tanks with cichlids who may tear up the leaves. The leaves of the crypt balansae are long and thin with unique ruffled edges. The plant tends to form in dense clumps which provides suitable hiding places for aquatic animals. This plant is a relatively slow grower, but is worth the effort for the unique texture and appearance. Light level required: Moderate-High light. Another of the Crypt genus, the crypt spiralis displays long thin leaves which form loose spirals as they grow up to 24” in length. 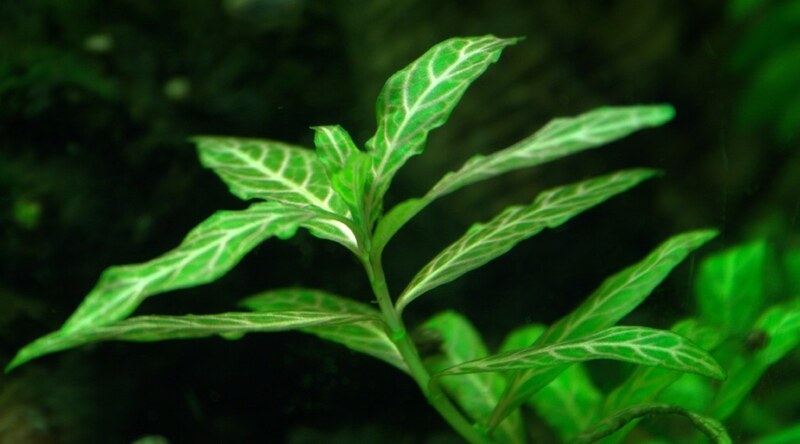 The leaves of spiralis are slightly thicker than the other Crypts, and while it grows slowly it will still tend to sprout shoots throughout the aquarium. Level of care: Beginner-Intermediate. Highly sensitive to changing conditions within the aquarium. 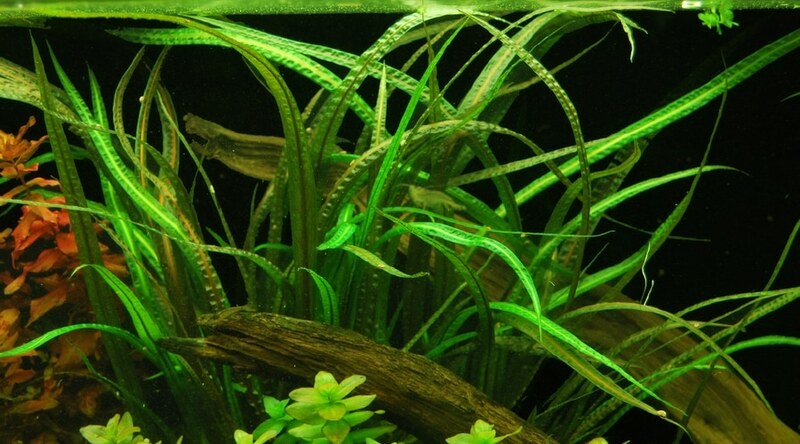 Guppy grass got its name due to its utility as a “nursery” plant for baby guppies. 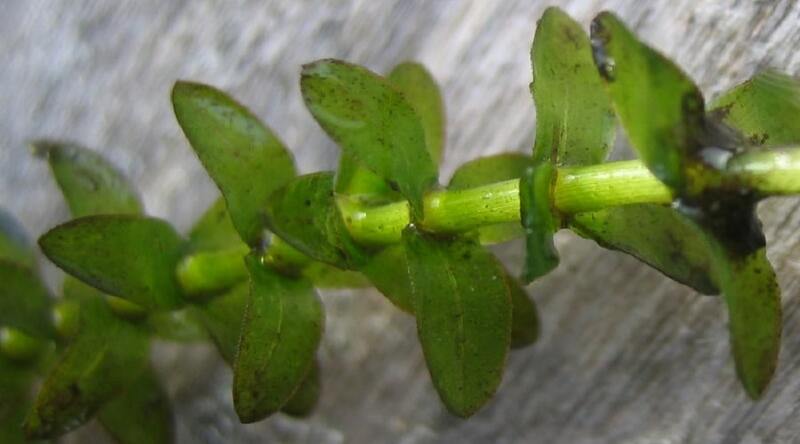 It has thin green leaves that grow in dense clumps. This plant tends to float in the tank and will grow steadily. Light level required: Any; low is sufficient. Compatibility: Excellent, especially for baby guppies! 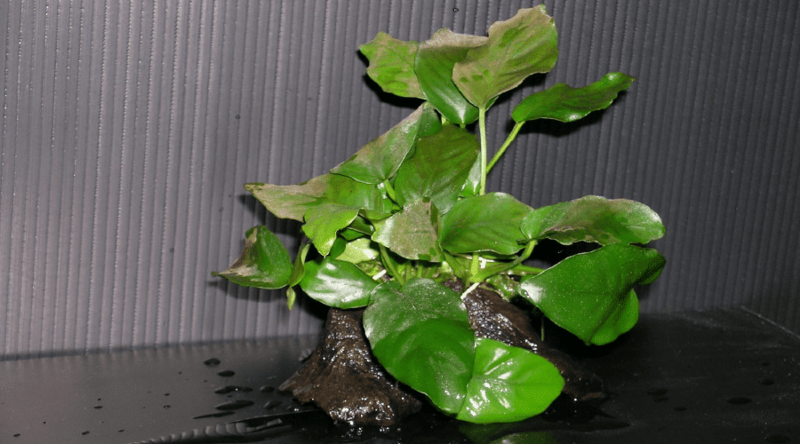 Anubias barteri has large arrow or heart shaped leaves that are bright green in color and have rippled edges. This plant stays relatively small, approximately 6” in height and 5” in width. It is a slow-growing plant with hearty, tough leaves. Compatibility: Excellent; hearty enough to withstand even the most plant-loving of aquarium dwellers. 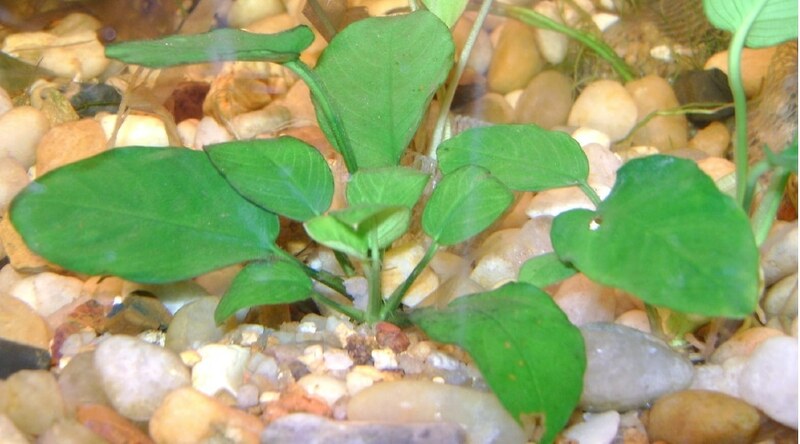 Anubias nana is the smaller relative of A. barteri, though both species have large leaves relative to the overall size of the plant. Nana is a low, bushy, slow spreading plant which attaches itself to driftwood or other objects in the aquarium. Like barteri, it features arrow shaped leaves, and the plant stays relatively small. Light level required: Low light. Though Pelia is visually quite similar to a moss, it is a distinct plant which serves different purposes from most mosses. 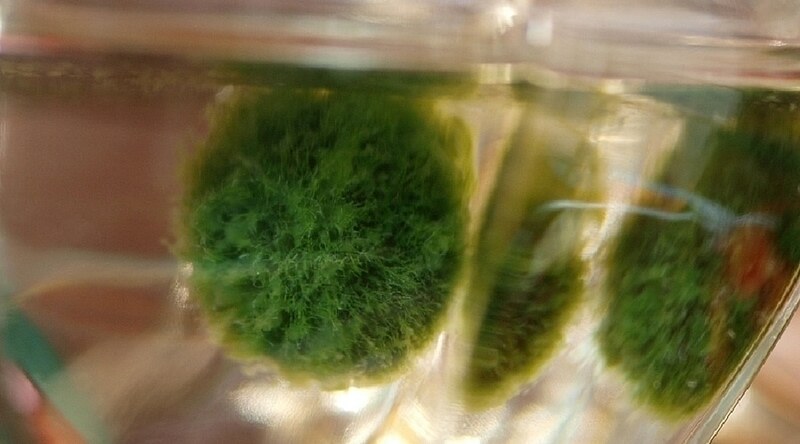 Unlike moss, Pelia does not attach itself to structures and grow rapidly in thick mats. Pelia sinks naturally, and can be allowed to free float or can be anchored down using netting or fishing line. 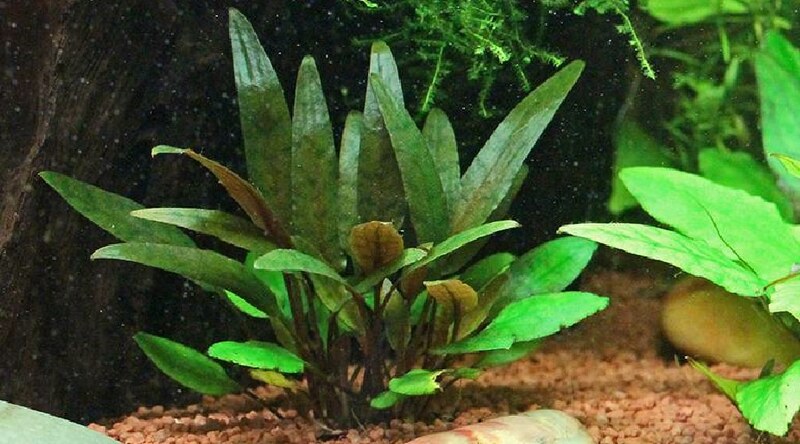 Pelia is commonly used for aquascaping, and is a popular choice due to the unique structure of its shoots. Compatibility: Moderate. Should not be included in tanks with rough or schooling fish, which may easily damage the brittle Pelia. The waterwheel is among the most exotic of the aquatic plants discussed thus far. 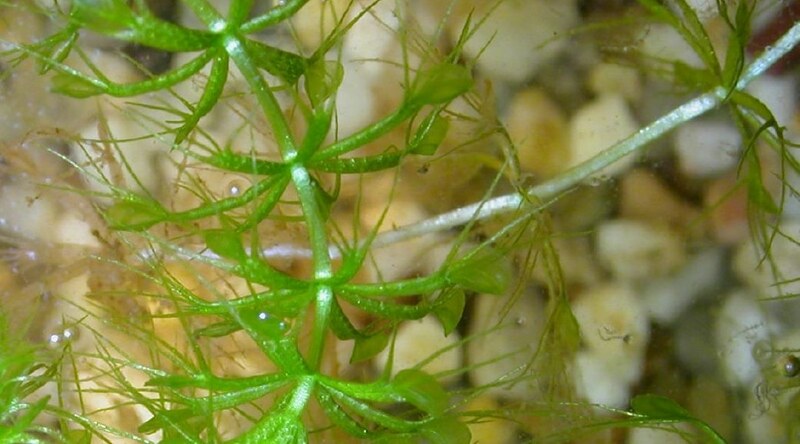 It has been likened to an aquatic Venus fly trap, an appropriate comparison due to the small carnivorous traps at the end of each whorl (or “spoke”) of the plant. The waterwheel feeds on aquatic insects, and tends to free-float on the surface of the water in order to “hunt” for its prey. Light level required: Moderate to Full. Compatibility: This plant requires a diet of meat, supplied through daphnia, insects, snails, tadpoles, mosquito wigglers, etc. This must be considered prior to introducing the plant to an aquarium. 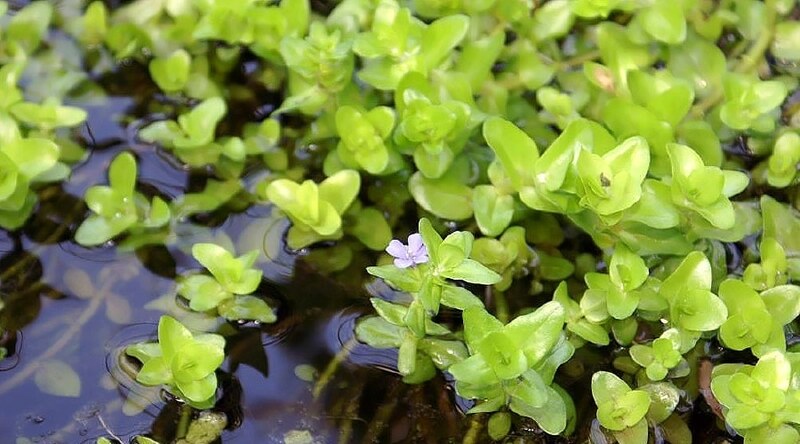 Another classic aquatic plant, the Bacopa is recognizable by its oblong leaves which grow opposite each other, creating a “ladder” up each stalk. The Bacopa varies in color from bright greenish-yellow to brown, and it must be provided with a sufficient substrate to take root in. It is a slow growing plant which can reach up to 12 inches in height. 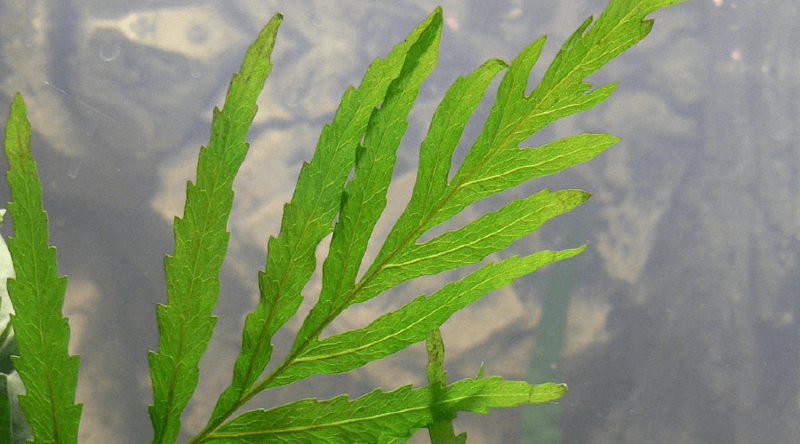 Elodea is a fast growing long stemmed plant which takes well to being floated or rooted in substrate, and provides sufficient cover for small fish. The elodea can be seen commonly growing naturally in ponds and lakes in North America. It is a food staple for many aquatic animals such as ducks, turtles, beavers, etc. However, it is considered an invasive species in some states, so local laws must be consulted prior to introducing this plant to an aquarium. Compatibility: Good, but many fish and aquatic animals seek out elodea as a main food source. Should not be included in tanks with fish who feed on soft plants, unless the plant is being provided as a food source! Like the crypts described above, the micro crypt is a slow growing plant with thin, long leaves which feature ruffled edges. The micro is the smallest of the crypt varieties, only attaining a full size of a few inches in height. Compatibility: Good but should not be included in plants with cichlids who may tear up the leaves. 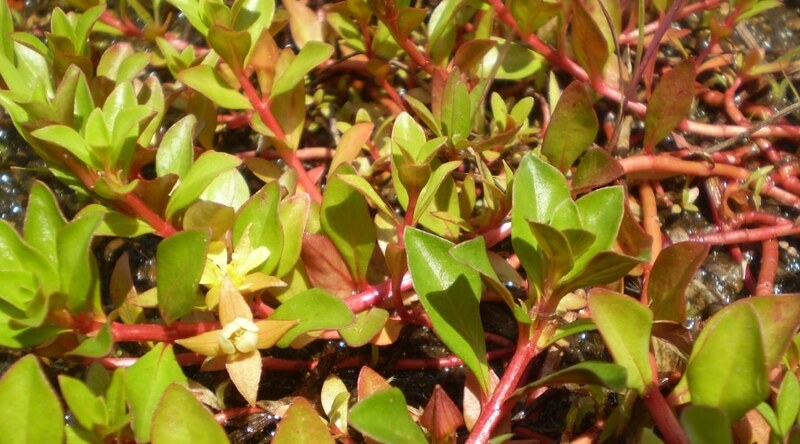 The Red Ludwigia is a favorite for the bright red foliage it displays in the proper lighting. It is a stem plant which grows quickly and requires regular pruning. Often, large groups of shoots are planted together. 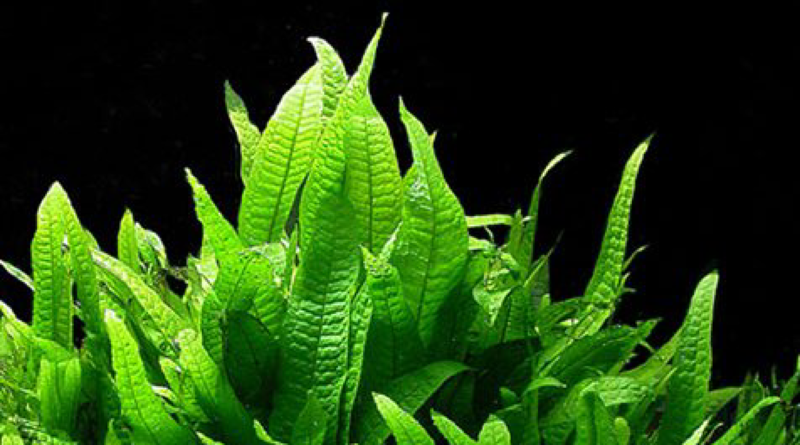 It is commonly included in the foreground of aquariums and it easy to maintain once planted in substrate. Light level required: Moderate; too low light will cause loss of leaves and diminish the color. Commonly mistaken for a moss, the Marimo is actually a strain of spherical algae which grows outward radially, naturally forming a ball shape. 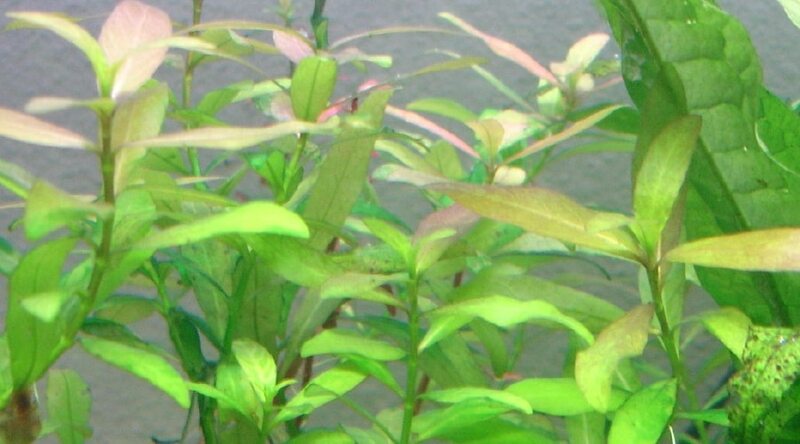 These low light aquarium plants grow very slowly, but are incredibly easy to care for and have long lives. They are a favorite for their unique appearance, and are commonly used as décor. Light level required: Low light to avoid browning. Compatibility: Excellent, but monitor to ensure that the fish are not overeating the marimo ball and disturbing its growth. Popular choice for betta tanks, should not be used in goldfish tanks. 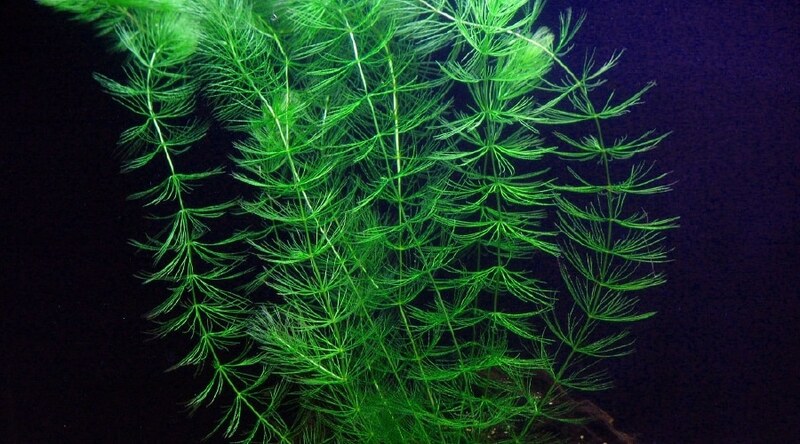 African water ferns are a robust plant with long stalks are delicate dark green leaves. The fern grows very slowly, but can grow up to 16-18”. African water ferns anchor themselves to rocks, bark, or substrate, and will naturally tether themselves. Compatibility: Excellent, especially when paired with algae-eating fish or shrimp. The coffee leaf anubias is known for its oblong rippled leaves which spread out from the plant, growing wide rather than tall. Coffee leaf anubias tend to grow quite rapidly, and can be shallowly planted in substrate or attached to driftwood. Compatibility: Excellent, especially when paired with algae-eating fish. 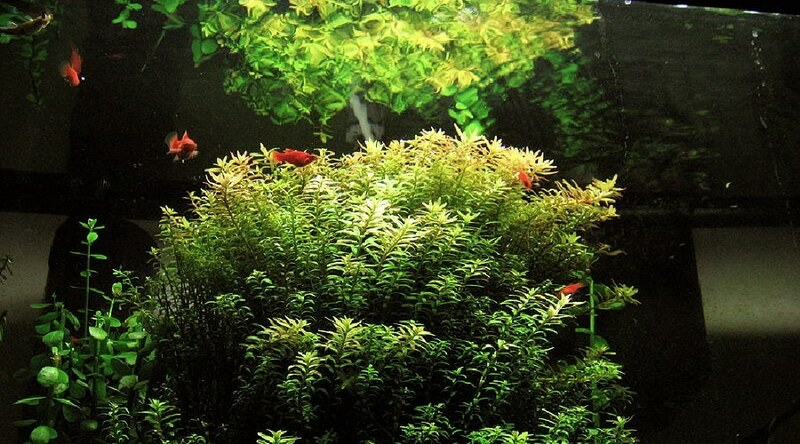 Picking out a good mixture of low light aquarium plants is a very important step for beginners. By following our all-inclusive guide, aquarium owners of any skill level should be able to set up a diverse, compatible flora ecosystem is their tank. Even though most of the species we have covered in this guide have relatively low-light requirements and tend to be easy to keep alive, remember to always take proper care of your aquarium. Weekly or bi-weekly water changes are a must, especially for those who decide to keep plants. With the proper care the a good set up, your planted aquarium will thrive for years to come!